As excitement builds for the upcoming release of Mortal Kombat X and everyone on the planet continues to guess as to which characters will make the cut, it seems as if Netherrealm Studios has answered our prayers with a brand new trailer. This time, rather than a specific character reveal or a gameplay highlight it’s giving us an introduction to the story mode. For those of you who played the previous entry, you’ll remember the effort put into creating a compelling narrative single player experience (for a fighting game, anyway) and it looks like this one’s no different. As already revealed, it takes place directly after the events of the previous game and spans a period of over 20 years. Because of this we will be introduced to the offspring of some of our favorite characters such as Cassie Cage (daughter of Johnny Cage and Sonya Blade). There are two big reveals in this trailer. One being the new group of protagonists, including the daughter of MK veteran Jax, Jaqueline Briggs as well as Takashi Takeda (son of Kenshi) and Kung Jin. Secondly we have Mileena appearing in a very important role as the leader of an Outworld rebellion. We also get quick and not-so-quick glimpses of new and returning characters aplenty. Keep in mind that simply because they appear in story mode does NOT necessarily mean that they will be a playable character, but here and some of the new ones that I spotted. About 35 seconds in Shinnok appears fighting Raiden. At the 0:52 mark Erron Black (a new character introduced in the Mortal Kombat X comics) shows up walking next to Ermac. Tarkatan warriors show up around 1:07, so this may mean that Baraka will appear. At 1:19 there’s a really quick shot of Rain kicking Kotal Khan off of a rooftop. Finally, at 1:24 we Sindel fighting Cassie, but she now has yellow veins or cracks covering her body. 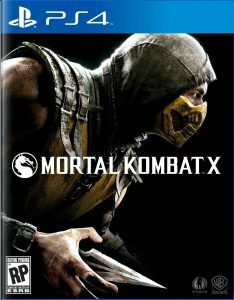 On top of all of that we see both Scorpion and Sub-Zero unmasked, the latter of which now sporting his MK3-era facial scar. Mortal Kombat X hits shelves April 14th, 2015 for PS 4, PS 3, Xbox One, and Xbox 360. Stay tuned for more info as it is announced. Re-Animator Sequel On The Way Next Year?